are there risks to consider when raw feeding? Both raw and processed diets come with risks - you, as the pet-owner, will have to weigh these up and decide what is best for your pet. At Raw Essentials we chose to raw-feed because we believe that feeding a highly-processed, high carbohydrate diet to our domestic carnivores may carry a significant risk. Some cats and dogs have a well-balanced microbiome, and a robust immune system - these are the ones that appear to do well (at least initially) on processed diets. But there are many cats and dogs who are not robust, and they will struggle with continuous health issues. 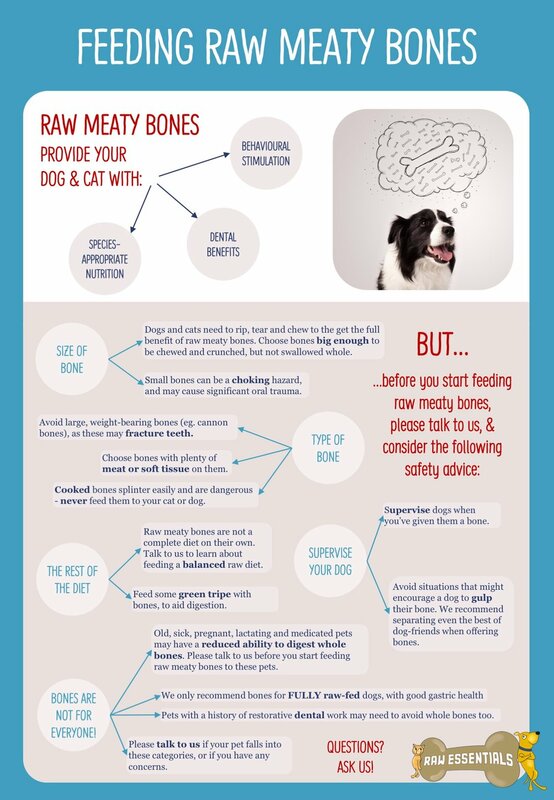 Raw feeding won't fix every issue for every pet, but many of these pets do so much better when they are fed high quality, species-appropriate diets. Feed only raw meaty bones that are large enough that they can NOT be gulped down in one piece. Your cat or dog should have to work their way through a meaty bone - not swallow it whole! For example: chicken necks suit cats and very small dogs well; however we advise against giving them to a Labrador (unless the necks are still attached to the whole frame). Avoid large, weight-bearing bones (such as cannon-bones), as these may fracture teeth. Defrost cubes of minced product (here is how to do it safely) before feeding them, to discourage your pet from trying to swallow them whole. Make sure that your pet has a stress-free eating environment. Each pet needs space well away from other pets so that they do not feel they need to eat quickly. NEVER feed cooked bones: They splinter easily, and could perforate the gut. Know your pet: Are they a nervous eater, or a gulper? Or are they chilled-out, raw meaty bone experts? Supervise your pet when they are eating! Plan their mealtimes to coincide with you being at home. Watching your cat or dog work their way through a raw meaty bone meal can be a very enjoyable way to spend some time with them. Watch their wonderfully specialised teeth and muscles getting the workout that they evolved for. If a cat or dog is lucky enough to have really good gut health (balanced microbes, good intestinal integrity, and strong gastric acidity), they may get away with eating all sorts of things. But the rise in chronic disease reflects a drop in good gut health: currently, the trend is for fewer and fewer dogs and cats to have really good gut health. Diet is going to become an increasingly important first line of defence! We are concerned about this growing demographic, and we tailor our advice to make raw feeding as safe and efficacious as possible for them. You will hear us repeatedly advise against mixed-feeding. Our concern is that the high carbohydrate content of processed foods may interfere with the production of strong gastric acidity - raising the possibility that the bone is not digested and passed efficiently, and obstruction could occur. So while we acknowledge that some people will choose to feed a mixed diet, and in some cases this will not be problematic - we believe that avoiding mixed feeding is the best and safest advice. Old, sick, pregnant, lactating and medicated pets may have a reduced ability to digest whole bones. Pets with a history of restorative dental work may need to avoid whole bones too. If the diet is well-planned, the dog or cat will generally have great dental health. A well-planned diet utilises appropriate bones for chewing and crunching on. The weight-bearing bones of large herbivores - such as the cannon bones that are routinely sold at supermarkets, and sometimes recommended by vets - are NOT appropriate. These bones are large and hard - just perfect for cracking a tooth. Appropriate ones are smaller, softer, and always meaty. Small prey species (chicken, possum, wallaby, rabbit, hare etc) are suitable choices. Veal brisket is also nice and soft. Nutrient imbalances are a risk in all diets - processed (including AAFCO-approved and veterinary diets), or raw. Common errors when raw-feeding include feeding an all/mostly meat diet, or feeding from a single protein source. Read more about balancing a raw diet here. Read about calcium, phosphorus and bone health here. Contamination with pathogenic (disease-causing) bacteria/microbes is a common concern with regards to raw-feeding. This is not a raw-food issue: it is a food issue. there are numerous recalls for contamination of processed pet foods; and as raw feeding grows in popularity again, we can probably expect to see recalls for raw food too (at least in the US). We are lucky in New Zealand - we have access to really high quality raw pet food, and our short food chains allow us to maintain stringent traceability programmes, so we do not expect contamination issues to present a significant problem here. Nevertheless, we must still take care to keep our raw-fed pets, and their owners, safe. Nurturing gut health - strong gastric acidity allows for the safe ingestion of some potentially pathogenic microbes; so if a pet has great gut health, they may get away with eating a higher bacterial load. You can read more about Salmonella and raw feeding here. Can Raw Feeding cause hyperthyroidism in dogs? This can be a risk if the diet is poorly planned. Read more here.